Home > English Page Top > Quit Smoking! You are endangering your own life as well as others by smoking and you are well aware of it. You have tried so many times quit smoking but failed. Dr. Andy will help you out with his new Anti-Aging Program. To give smokers a greater chance of kicking the habit, Dr. Andy has developed a new product: Dr. Andy`s NicGel. This is a very special preparation with a very low percentage of nicotine in a liposome gel. This gel is able to easily penetrate the skin and quickly suppresses the urge to light up. Continual use will help the patient reduce the amount of tobacco intake and eventually kick the habit entirely. It is also very useful when you are in non-smoking places such as a plane, train or during a meeting or when you are in the theatre. Dr. Andy's NicGel goes beyond treatments such as the patch or nicotine gum, which only provide a shot of nicotine to calm withdrawal symptoms. The gel helps to cut down gradually your habit of smoking. Because smokers' skin suffers in many ways: rough skin, pore damage and premature aging, and to combat the harmful effects smoking has on skin, Dr. Andy also provides a powerful antioxidant cream. Dr. Andy`s NicGel and Dr. Andy`s High Potency Antioxidant Cream are two important products in his Quit Smoking Program. There are more. The High Potency Antioxidant Cream consists of powerful antioxidants like ALA, vitamin C, vitamin E, Co-Q10, and green tea extract -just to name a few. 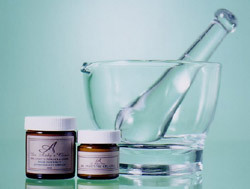 The antioxidant cream contains other natural but strong elements that revitalize your damaged skin. The NicGel is simple to use. A dab of only 0.1 ml on your neck or the inside of the upper arm is all that is needed to quiet withdrawal symptoms. Your urge of lighting a cigarette will just disappear in a matter of minutes. The High Potency Antioxidant Cream is applied like a moisturizer twice a day, in the morning and at night before going to bed. Many patients take medical/surgical treatment for skin regeneration these days. Why not realize that tobacco does a lot of harm to your skin and start helping yourself. This combination of NicGel and the High Potency Antioxidant Cream is a must if you are serious.This Anti-Aging Program is an original program developed by Dr.Andy in North America.